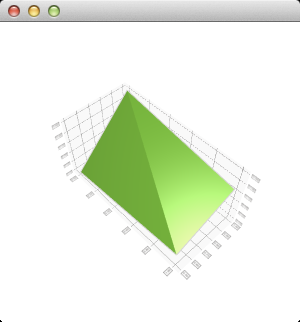 The Q3DSurface class provides methods for rendering 3D surface plots. This class enables developers to render 3D surface plots and to view them by rotating the scene freely. The visual properties of the surface such as draw mode and shading can be controlled via QSurface3DSeries. The Q3DSurface supports selection by showing a highlighted ball on the data point where the user has clicked with left mouse button (when default input handler is in use) or selected via QSurface3DSeries. The selection pointer is accompanied with a label which in default case shows the value of the data point and the coordinates of the point. The value range and the label format shown on the axis can be controlled through QValue3DAxis. To rotate the graph, hold down the right mouse button and move the mouse. Zooming is done using mouse wheel. Both assume the default input handler is in use. If no axes are set explicitly to Q3DSurface, temporary default axes with no labels are created. These default axes can be modified via axis accessors, but as soon any axis is set explicitly for the orientation, the default axis for that orientation is destroyed. The scene can be rotated, zoomed into, and a surface point can be selected to view its position, but no other interaction is included in this minimal code example. You can learn more by familiarizing yourself with the examples provided, like the Surface Example. See also Q3DBars, Q3DScatter, and Qt Data Visualization C++ Classes. This property holds whether the horizontal axis grid is displayed on top of the graph rather than on the bottom. In some use cases the horizontal axis grid is mostly covered by the surface, so it can be more useful to display the horizontal axis grid on top of the graph rather than on the bottom. A typical use case for this is showing 2D spectrograms using orthoGraphic projection with a top-down viewpoint. If false, the horizontal axis grid and labels are drawn on the horizontal background of the graph. If true, the horizontal axis grid and labels are drawn on the opposite side of the graph from the horizontal background. Defaults to false. If selectionMode has SelectionMultiSeries set, this property holds the series which owns the selected point. Constructs a new 3D surface graph with optional parent window and surface format. Destroys the 3D surface graph. If axis is null, a temporary default axis with no labels and an automatically adjusting range is created. This temporary axis is destroyed if another axis is set explicitly to the same orientation.